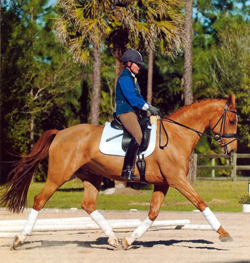 What is the secret to getting your horse to do extended gaits? 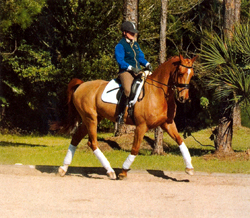 I event and when I watch even a Training-level test, it seems like a “switch” has been turned on and the horse performs a beautiful extended trot or canter. 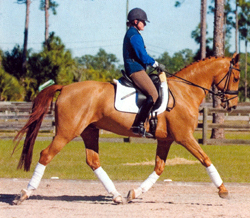 There is no secret to great lengthenings, which eventually lead to great medium and extended gaits. They're merely a product of correct dressage training-weeks and even months of strengthening, conditioning and, most importantly, developing balance. With these basics established, even horses to whom extended gaits don't come easily can learn to flip the “switch,” provided they possess another key ingredient: trust. When your horse reaches forward into the contact and swings his back more energetically to create bigger steps, he needs to trust that the soft, harmonious connections between your hands and the bit, your seat and the saddle, and your legs and his sides won't change. If you lose your balance, even momentarily, and pull back on the reins or bounce heavily on his back, he'll tense and stiffen in reaction-and will be reluctant to offer you his best efforts in the future. So it's essential to show him from the beginning that he will never be punished for going forward. Great Lengthenings, like the one I'm demonstrating here in Ruudi, a 10-year-old Dutch Warmblood owned by Ingrid Wallin, are the product of correctly strengthening and conditioning your horse and developing his balance. This month, I'll discuss the skills you and your horse need before attempting lengthenings, then give you a simple forward-and-back exercise to help you produce confident ones. Next month, I'll give you some cavalletti exercises to further build the engagement, power, suppleness and swing in you horse's back for beautiful lengthenings. Before trying lengthenings, you need to make sure your horse is responding independently to your leg and rein aids. The most basic lesson he must learn is that leg means “go!” When you add leg pressure, he should promptly increase his pace and or impulsion. To reward him, you must then immediately lighten you leg pressure, allowing him to move his body freely forward. Some horses resist leg pressure by backing off the pace and becoming stiff. 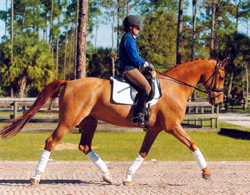 To correct this, practice riding walk-trot transitions. Each time your horse responds properly to your legs by moving willingly forward, praise him and lighten your legs. When he's in balance, the energy created by his hind legs will transmit through his relaxed back and neck into the contact, which recycles the energy back through his body to his hind legs. To check that this circle of energy is flowing smoothly, take an inventory: Do you feel a supple, elastic connection in both hands, with your horse giving in his neck, carrying you nicely forward through the contact? Test this in any working gait by applying a little more pressure to the reins to ask for a half halt or downward transition. Does he respond promptly without resistance? If you must apply strong pressure to achieve a response, the connection needs to be improved. 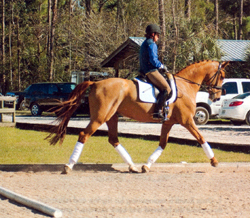 Practice trot-walk transitions to make sure your horse is responding to your aids before you move on to learning lengthenings. Similarly, there should be harmonious connections between your horse and your seat and legs. You want to feel a nice, swinging rhythm in your seat, freely following his motion, while your legs rest lightly and relaxed against his sides. He should maintain the forward gait on his own, without you feeling the need to push with your seat or squeeze your legs. Test him by taking your legs off his sides for a few strides. If he responds by slowing down immediately, you need to work on getting him more “in front of” your leg. Tip: Increasing your horse's strength and suppleness in his back can improve his capacity to lengthen. Work cross-training exercises, such as leg-yielding, hill work and trot poles, into your weekly routine, always focusing on maintaining his trust and circle of energy. Before teaching your horse lengthening, you need to be sure he is responding independently to your leg and rein aids in the working paces. Here the energy created by Ruudi's hind legs is transmitting through his relaxed back and neck into the contact, which recycles the energy back through his body to his hind legs. 2. ...applying a little more leg pressure to encourage him to go slightly more forward and animated. I'm also concentrating on my balance: I'm stretching my legs long and my upper body back and tall. My center of gravity is balance over the middle of the saddle, and I'm following his motion with a swinging seat. I'm softening my fists and writs, thinking of following Ruudi's mouth forward. 3. After a few steps, I gently ask him to return to the working trot by making a fist with my outside hand to half-halt, stretching up even taller and then releasing in my legs. 4. There's still room on the long side, so I ask Ruudi for just a stride or two more of forward active steps into a nice rein contact. 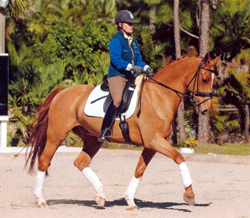 When your working trot feels really rideable, your rein, seat, and leg connections are all harmonious, and his responses to your leg aids are forward and prompt-begin to play within the gait. 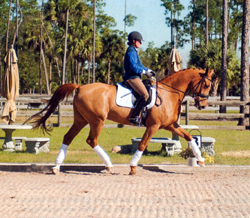 Down the long side of the arena, apply a little more leg pressure to encourage him to go slightly more forward and more animated for a few steps. Concentrate on your own balance as you do so, stretching your legs long and your upper body back and tall, and keeping your center of gravity balanced over the middle of the saddle. Also soften you fists and wrists, thinking of following his mouth forward. Don't expect much at first. If your horse loses his balance and quickens his steps or breaks into the canter, reward him for the forward response by staying soft in your hands and swinging in your seat. Ride him forward into a nice rein contact before gently asking him to return to the original working trot. Then, if there's still room on the long side, ask for just a stride or two more of forward, active steps. Sometimes a horse will give you the wrong answer to an aid. If he does, you don't want to make the mistake of trying to ask in a different way or giving up. You need to ride to the other side of the mistake, get what you want even if just for a couple of steps and then praise your horse. By doing this, your horse will try to give you the right answer sooner, even if it is harder than the answer he would like to give. And by not punishing him with strong pressure on the bit or resistance in your seat, you'll help him maintain that essential confidence to go forward without tension. When you reach the corner, half halt to ask for smaller, more balanced steps across the short side. Then, if he's still accepting the soft contact-not leaning on or bracing against the bit-ask for a few more forward steps down the next long side or diagonal. If he gets strong in the bridle, apply slightly firmer rein pressure for a step or two to remind him to stay in the circle of energy. Otherwise, stay soft in your hands-without throwing the reins away, which would let the energy escape through the front. Once your horse is maintaining his rhythm and relaxation throughout his forward and back exercise gradually begin increasing your leg pressure to ask for more energy, which will produce longer steps. Only ask for as many steps as he seems capable of doing easily and always reward his efforts with soft, following body language. Before you know it, you'll find that magical switch and he'll produce the beautiful lengthenings you always knew he could do! Tip: Start “playing” with lengthenings within whichever gait you feel more competent and your horse feels more balanced and rideable. For most people, it's the trot, but some prefer to start with the canter. 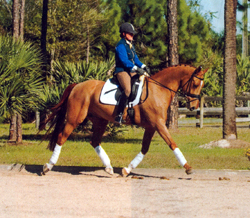 Later, when you progress to medium and extended gaits, work on the trot first, then the canter. In the trot, it's easier to relax and feel the correct wing in your horse's back, while letting him do his job. 2. ...which produces the longer steps needed for a lengthening. As before, I am stretching my legs long and my upper body tall, while staying balanced over the middle of the saddle. With a supple lower back, I'm swinging in my seat and softening my hand, allowing him to go forward.